Social media has been, time and again, used by some self-acclaimed historians, celebrities and intellectuals to make unsubstantiated and lofty proclamations. The only saving grace is that while they get to call the shots on mainstream media, the equalising platform of social media does not allow lies to sprint around the world while the truth is putting on its shoes. Primary research-based facts act as the truth tortoise to the haughty hares of hearsay. In the past two years, there seems to be an overt attempt to somehow reduce the antiquity of Indic civilisation and faith. Whether people are doing it wilfully, or inadvertently, is not for us to decide. It is for people to interpret. One such attempt is the myth being propagated about the holy teertha of Shri Amaranthji. Last year, a celebrity proclaimed that this holy Indic shrine was discovered by a Muslim shepherd in 1850. This year, another self-acclaimed historian, caught faking facts repeatedly on earlier occasions, repeated the lie. Now, this is completely wrong. In the year 1842 when British traveller GT Vigne  went to Amarnath, he saw Hindu pilgrims there from all over India. Vigne wrote the following about Amarnath Yatra in 1842. Islamists and separatists in Kashmir often use this myth to negate the many millennia-old Hindu origin of the Valley. Their attempt is to subtly portray that the yatra is of recent origin and should be stopped. Gullible or nefarious elements who parrot the same lines are in fact propagating this agenda. The fact is that Hindus have been unrelentingly carrying out this yatra for centuries, even in the face of Islamist onslaughts. This is what the Nilamata Purana  declares about Amaresha: "By bathing at Amaresha, a man gets the merit of donation of a thousand cows." Nilamata Purana was written much before the Islamic prophet was born. The Teertha Amaresha mentioned in Nilmata Puran is the beautiful Shesh Naga lake near the holy shrine. Nilamata Purana has been dated as early as third century CE. This shows that Hindus have been visiting Amarnath Teertha from the dawn of Kashmiri history. According to Brngesha Samhita, an ancient scripture, Shiva offered the devatas amrita, the nectar of immortality, at this spot. The remaining portion froze into a lingam that is venerated in this shrine. That Amarnath Yatra continued well into the medieval age is testified by the great Kashmiri historian Kalhana in his 12th century chronicle 'Rajatarangini'. He mentions that Queen Suryamati of Kashmir built Mathas at Amareshwara (Rajatarangini 7.183) . Rajatarangini (1.267) makes it clear that the pilgrimage to Amareswara was current in the 12th century. Had Amarnath been lost and found, this would not have been possible. The Mughal governor of Kashmir, Ali Mardan Khan, is said to have ridiculed the devotion of streams of Hindu pilgrims (a reference to Amarnath yatris) walking through rain and snow to behold "something in a cave", even in the 17th century. It is clear that that Hindus have been visiting Amarnath with an unbroken continuity since at least 1,600 years. Hindus braved numerous difficulties related to climate as well as circumstances. 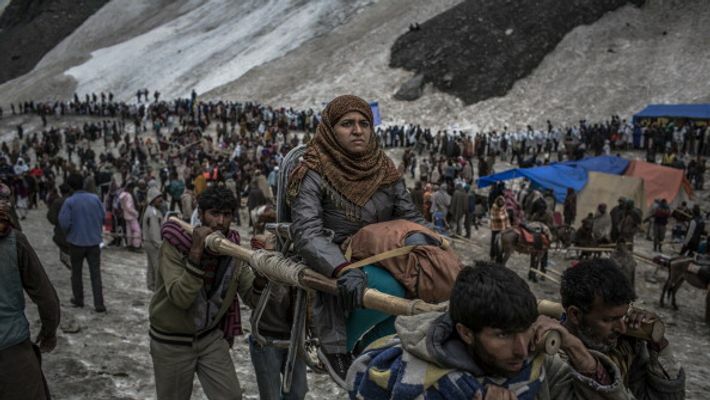 Jihadi attacks and stone-pelting has also not prevented them from abandoning the yatra. And it is also interesting to note that the yatra never ceased, by all accounts available. How then was Amarnath lost/abandoned and rediscovered? The above analysis renders this claim impossible. Moreover, this so-called shepherd named Buta Malik, who allegedly discovered the Amarnath cave in 1850 is not mentioned in any historical source of the 19th century. He is first mentioned only in the 20th century. Even the narration is not consistent, for the names of the alleged shepherd and the date of discovery varies from one account to another, all of which are recent and a product of the last century. The name varies from Adam Malik to Akram Malik to Buta Malik and the date varies from somewhere in the 16th century to the 19th century. It is most likely that this story was fabricated by local shepherds to claim a share of donations. A perverted form of secularism ensured that they succeeded. Travels in Kashmir, Ladak, Iskardo, The Countries Adjoining the Mountain-Course of the Indus, The Himalaya, North of the Panjab by GT Vigne, Esq FGS. Nilmata Purana, (6th to 8th century AD) from Kashmir, reference by Kalhana while penning Rajatarangini. Dr Stein thought it was unlikely that Amershwara shrine mentioned in this passage could have referred to Amarnath since the verse mentions two mathas built side by side. However, we now know that Amarnath indeed housed ancient mathas. At any rate, the very presence of the temples named after Amareshwara speaks volumes about importance of Amarnath throughout the medieval period. Travels in the Mogul Empire, by Francois Bernier.